A Universal Guide to Creating Believable Quasi-Medieval Settings! 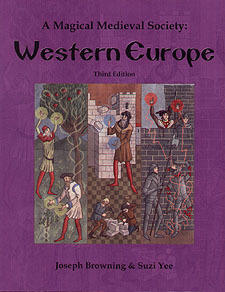 A Magical Medieval Society: Western Europe is a 208 page answer to many of the questions previously overlooked by gaming supplements. With informative text, generation systems, worksheets, and appendices, A Magical Medieval Society: Western Europe allows GMs and players to export the feel of medieval times without being tied to the history. This seminal work is a GenCon ENnie Best Supplement award winner and Origins nominee for best RPG supplement. The 3rd Edition includes over 160 illustrations providing a visual guide to your creation, an entirely new chapter on the naming of places, and extensive information on a long list of aspects of medievalesque fantasy world-building. Churches: How multiple sources of religion affect the medieval mindset. Aristocrats: How many in your kingdom, their income, and their lands. Buildings: How much and how long it takes to build anything you need. Economics: The best complex economic simulator for OGL ever created. Warfare: How magic changes and affects traditional medieval armies. Naming: How to name places using an extensive UK toponymical list. A Magical Medieval Society: Western Europe puts the wealth and depth of European demographics in your hands. It allows you to create your world the way you've always wanted it to be!